Found one file extension association related to mikroBasic and 1 file format developed specifically for use with mikroBasic. 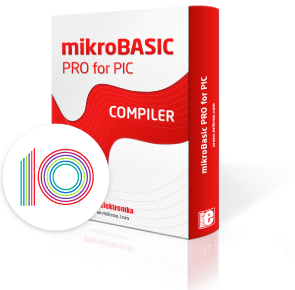 mikroBasic is a full-featured Basic compiler which will make microcontroller project development suitable for everyone. It comes in five flavors for five different microcontroller architectures. Popular basic programing language is the best choice for beginners because of the simple syntax and clear code. Comfortable IDE with a comprehensive help file, and a free lifetime technical support mean a lot when you are making your first steps into world of microcontrollers. Not to mention over 500 ready-to-use library functions and examples that will help you in your development. If you need more information please contact the developers of mikroBasic (MikroElektronika), or check out their product website.